Contemplated and designed in 1988, the journal 2000 was launched in April 1989 as one of the first new magazines of the reborn free press in Hungary. 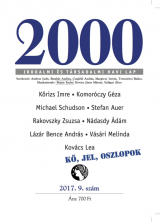 The profile of 2000 is properly described by its subtitle, “Literary and Social Monthly”. Literature refers to poetry, short stories, and short dramatic pieces, both Hungarian and foreign; while the focus of social interest is Hungary and eastern central Europe, that is, the former Soviet bloc. Naturally, this interest does not exclude a wider outlook over European and world issues.